Our parents can’t always be by our sides, telling us what to do and how to do it, guiding us through this complex maze called life— that’s why they write notes. 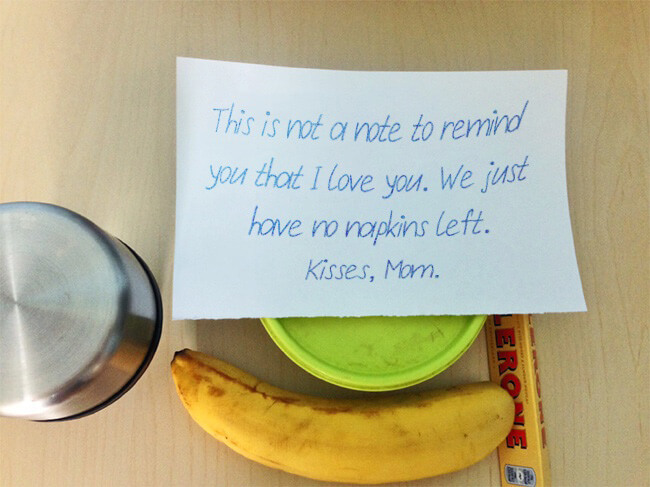 Notes are there when parents can’t be. They communicate what’s on their mind. 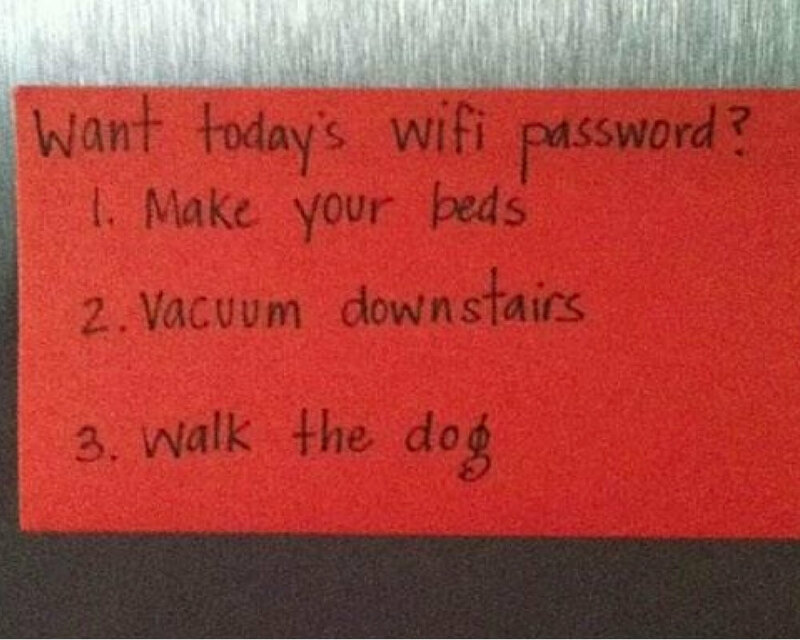 This clever parent changes his household’s wifi password every day. They only tell their kids the password after they’ve completed all of their chores. Sounds like an awesome parenting tactic to me. Soon the kids are going to get smart though, and they’re going to change the password before their parent can get to it. 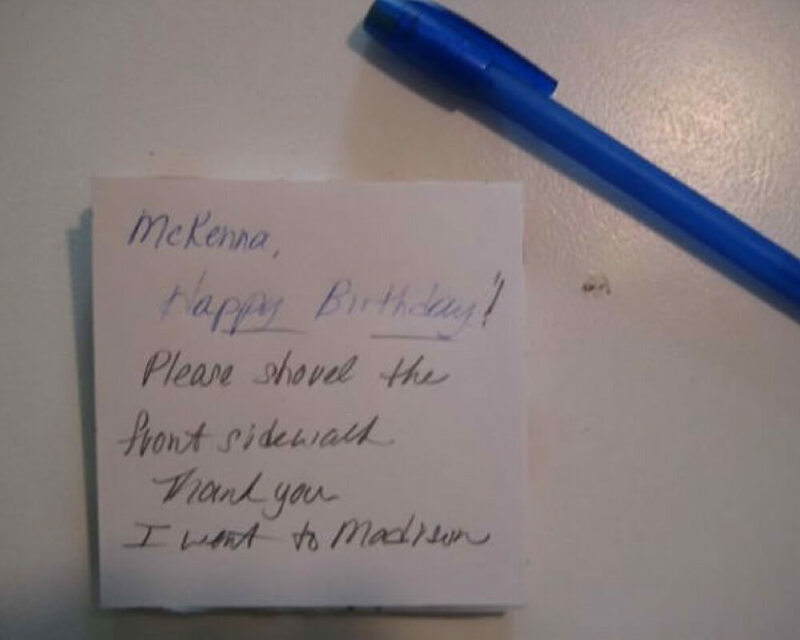 Poor McKenna, first her mother gives her a name like McKenna (no offense every other McKenna in the world) and then she tells her to shovel snow on her birthday, and then she peaces out to Madison. Savage, mom. Real savage. A “have a great day” would have been nice. Does Your Love Taste Like Cheeze-Its? 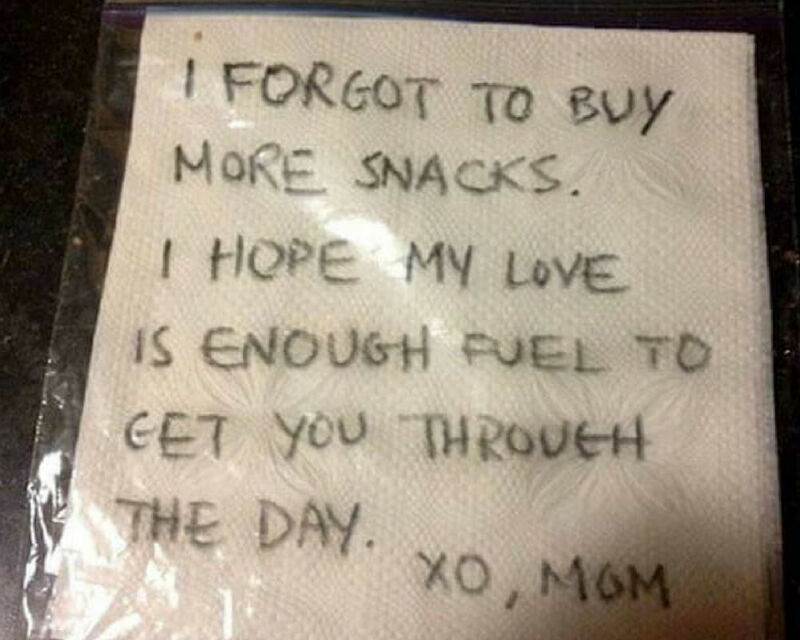 Thanks for the love, mom, but a napkin in a plastic bag isn’t going to fill my stomach with snacks. You know what will fill my stomach with snacks? Actual edible food. How about we supplement some of that love with pretzels or even a sandwich? 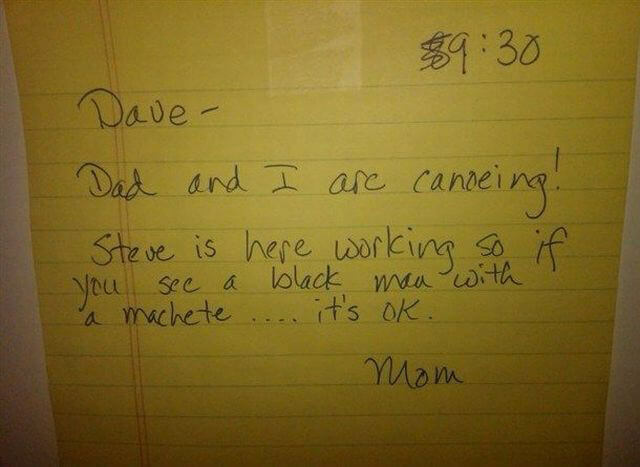 This note is a work of art. It is so beautifully written that I could weep. I love that she omitted the possessive pronoun before “bum.” It doesn’t matter whose bum, just bum in the general sense. All bums are created equal. 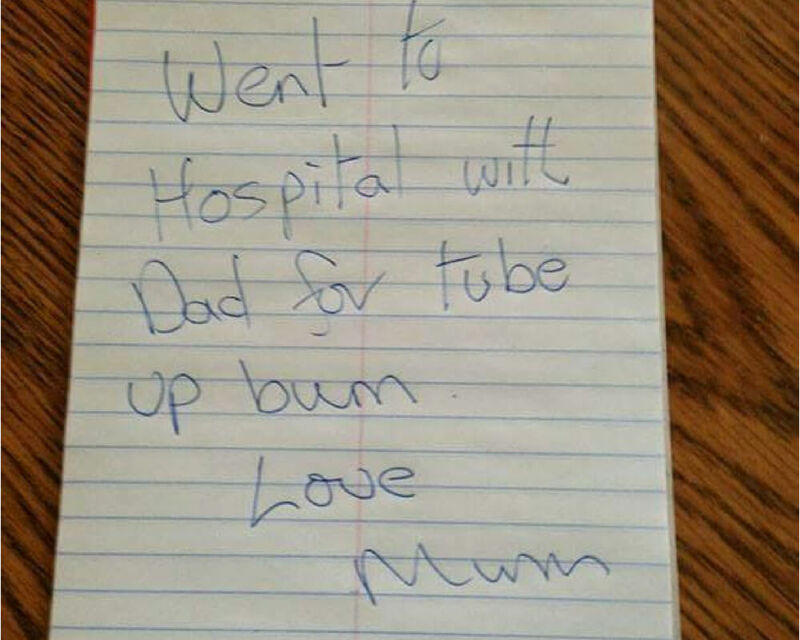 Also, the rhyme with “bum” and “mum” is just delightful. How would you feel if you spent an hour and a half cleaning a kitchen only to have a bunch of hooligan children undo all of your hard work? Not very good, I bet. The little heart at the bottom is a nice touch. She might cut you, but she’ll always love you. I bet you thought the kids in the last post had it rough. 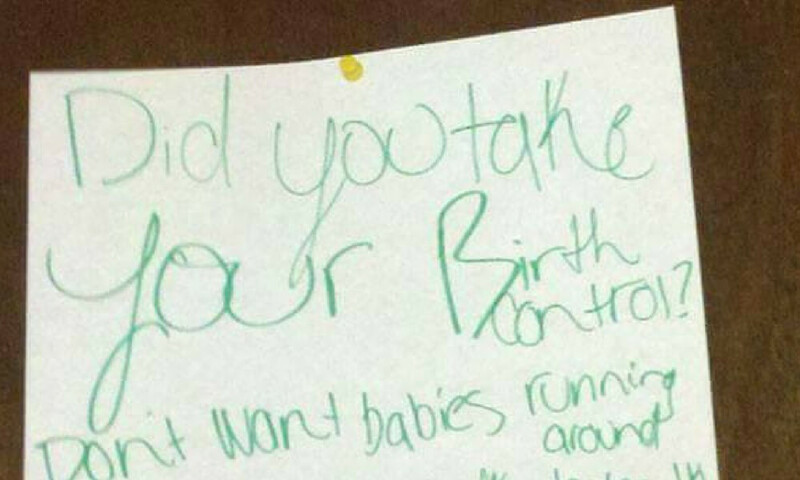 This mom needed two pieces of paper to get her message across. It does look like this note is mostly aimed at Kevin. Molly’s name seems to be somewhat of an afterthought. I guess we know who the real messy one is around this house. One thing is for sure, both mom and dad love their exclamation marks. If exclamation marks were a form of viable currency, Eric would be rolling in it. 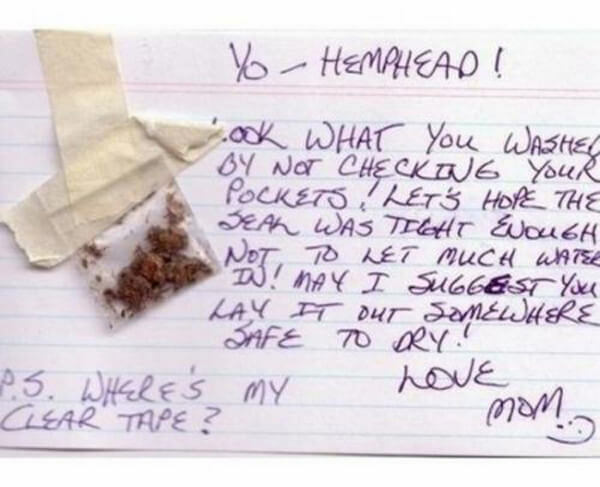 Mom and dad seem to disagree about what kind of trouble their son could get into while they’re away— or maybe mom just doesn’t want to think about it. 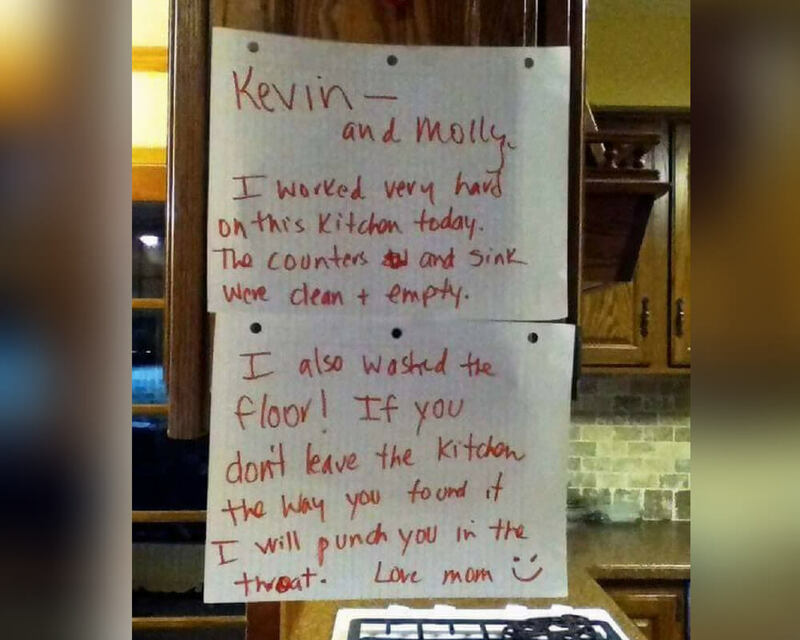 Does she expect her son to wipe his face with a piece of paper? Because that may qualify as cruelty to children. If the note wasn’t so cute, I might have reported her myself. A piece of paper is not a napkin. It just spreads the dirt around. I hope it’s not a tuna sandwich. If you don’t put lettuce in between the tuna and the bread, that sandwich is going to get soggy real fast. 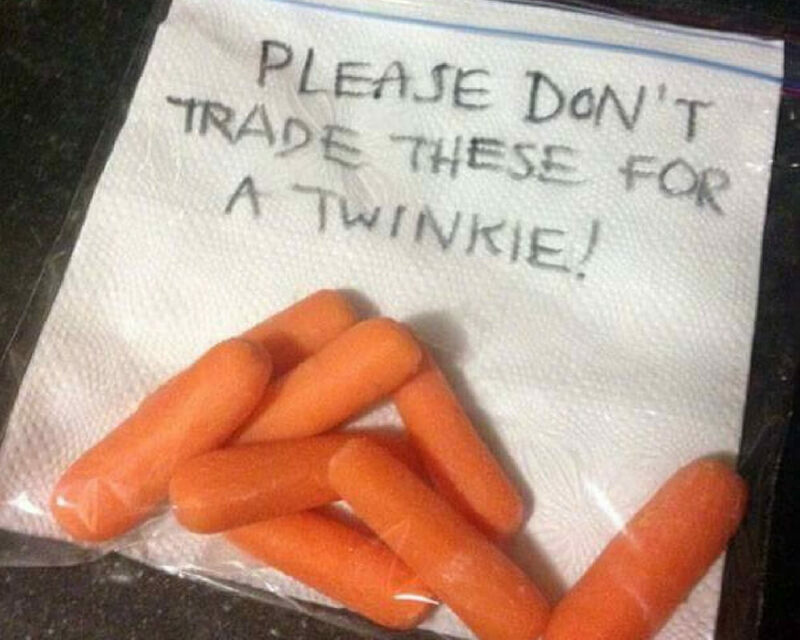 Honestly, kid, if it’s gross I would just give it to one of your friends who will eat anything, and tell your dad that you ate it. 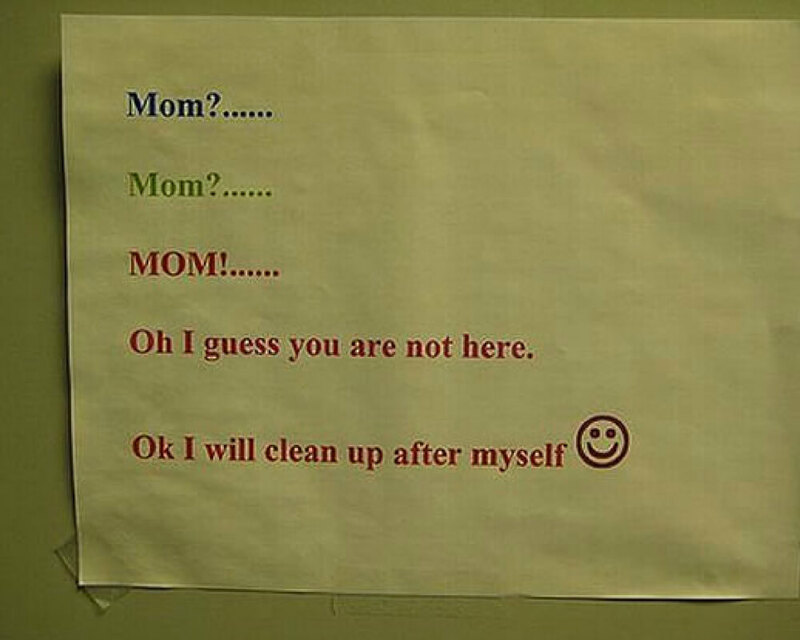 Moms don’t exist to clean up your messes. Please act like a human being and clean up after yourself when you make a mess. Also, don’t complain about having to clean up for yourself. That’s what people do, not just moms. Keep reading for a mom who is about to venture into dangerous territory. I really hope that these people live somewhere warm. I would hate to have to sleep outside on a cold night— but I guess that’s what happens when you’re not home when you’re supposed to be home. Next time this guy probably won’t stay out so late. So I think we’ve established that kids are pretty dumb. 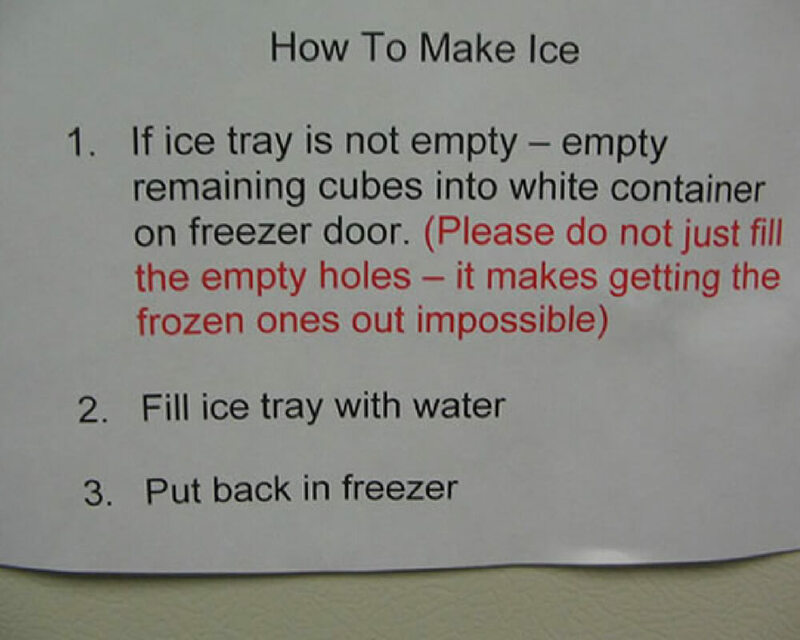 But are they too dumb to know how to make ice? Apparently, they are. It’s a recipe with one ingredient and what is pretty much one step, which is not a recipe at all, by a lot of people’s standards. This is the most accurate note I have ever read. 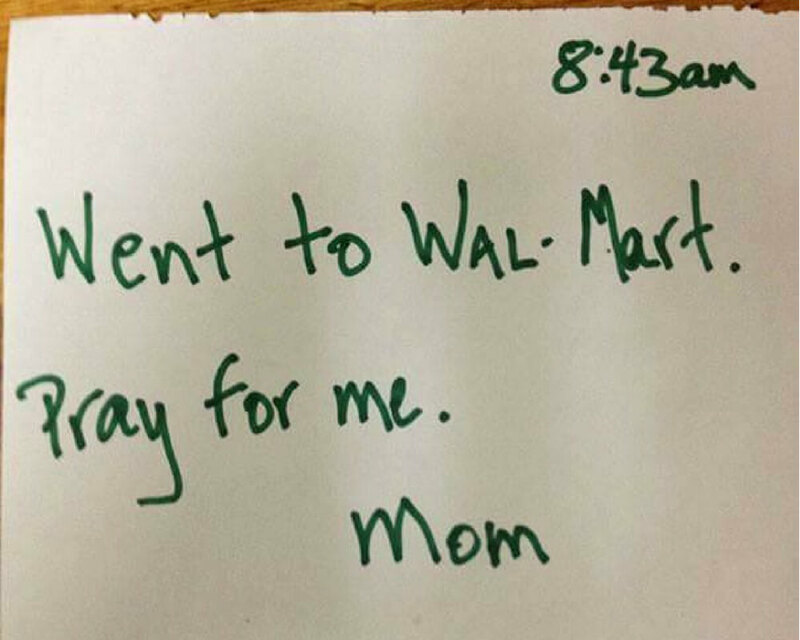 I don’t know if a prayer is going to help her, but it’s definitely worth a try. She left at 8:43, so if she’s not back in an hour, that’s when it’s time to panic. Keep reading for a mom who is too tired for your shenanigans. I don’t know what kind of school this mom thinks her kid goes to, but nobody in their right mind would take that trade. Modern moms know that kids will do anything for internet access. If you hold the wifi password, you hold the key to unlock their productivity. 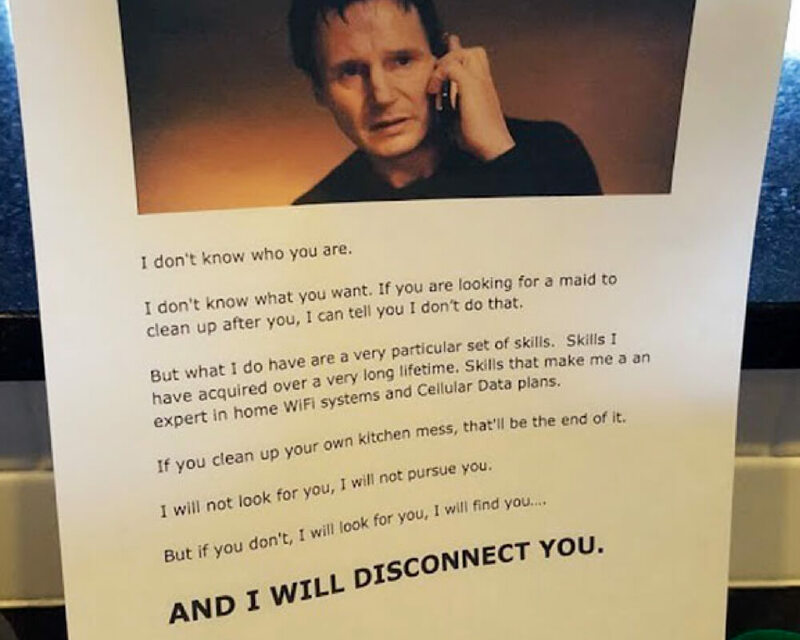 The Liam Neeson quote adds a little extra oomph. This is an A+ note. Bravo, mom. This is how you put 100% effort into parenting. 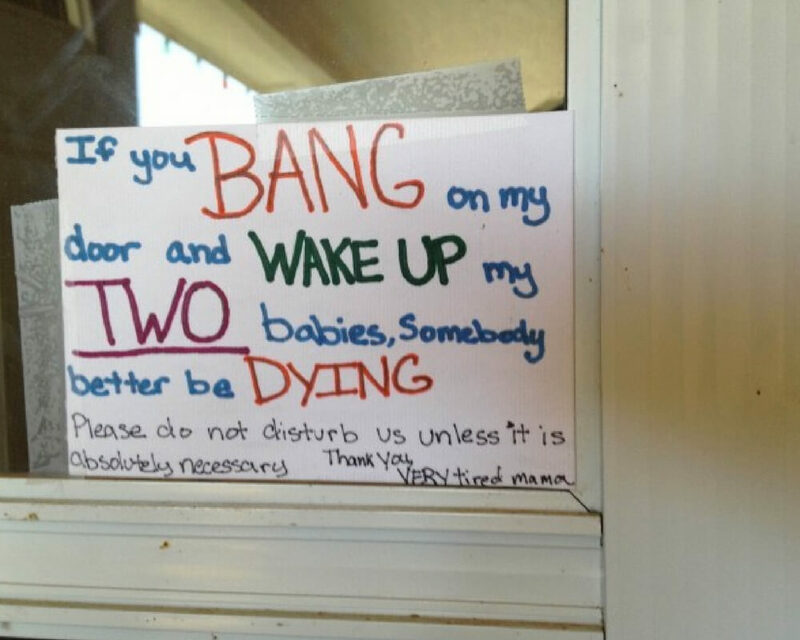 Every person with a new baby should take a cue from this mom and post threatening notes on their front door. Sometimes you just need a piece of paper and a few colored markers to really drive the message home. Read on for a mom who is just looking out for her daughter’s best interest. I wonder how many times this girl’s mom has just chucked a dead chicken across the street. Is there a pile of dead chickens over there? 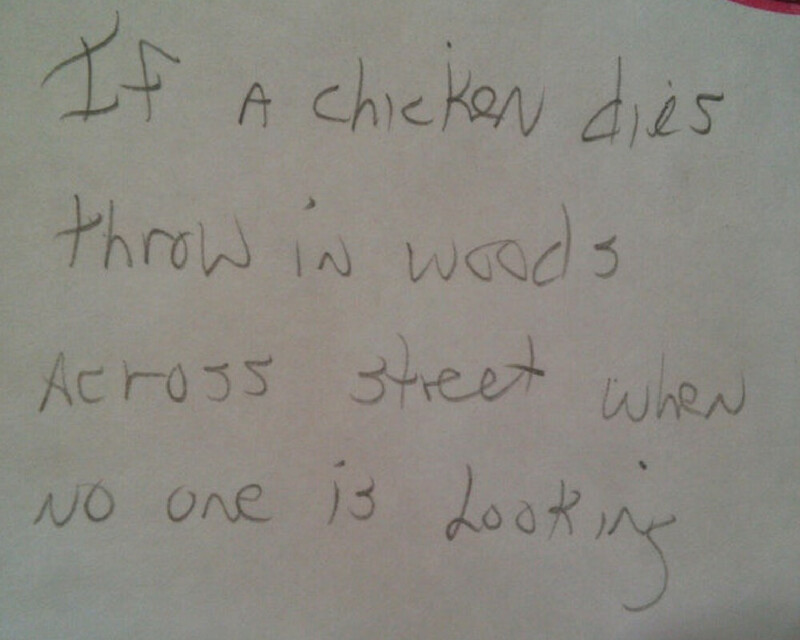 I’m pretty sure those “do not toss chicken carcass” rules exist for a reason— but thanks for the heads up, mom. I especially love that she wrote this note on “Hangover Part III” stationary. I think this is my new favorite note. It’s attached to a twenty dollar bill, it’s cute, and it promises an intriguing sermon. 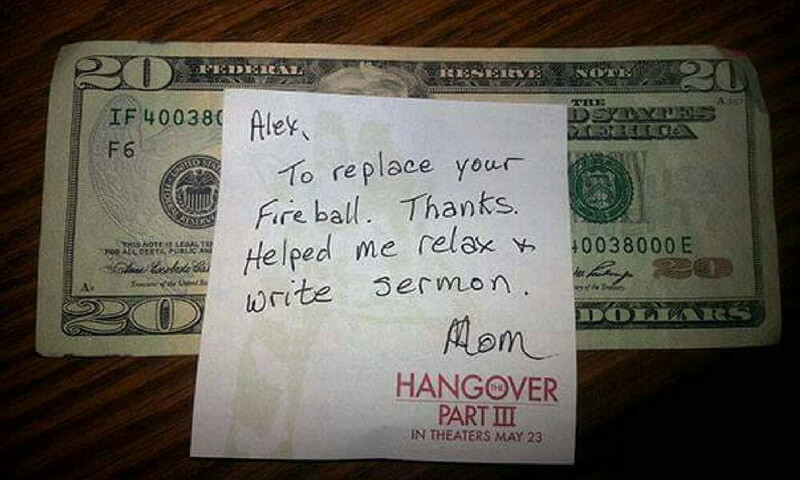 Alex is a lucky guy to have such a cool mom. If you need your mom to remind you to take birth control, maybe you should take a step back and examine your choices— just a thought. Hopefully, this is just a case of an overprotective, overbearing mother, and not of an irresponsible teenager. Somehow I doubt that, though. Tiffany has got this note writing thing all figured out. She’s basically a passive aggressive parent in training. I can’t wait for her future kids to be on the receiving end of her outstanding note writing abilities. 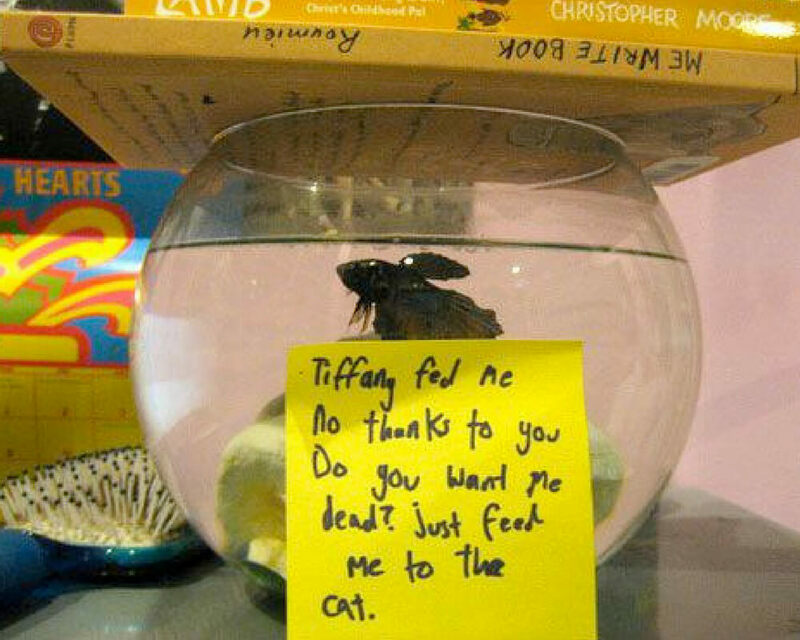 Also, Tiffany’s sibling, please feed your fish. Don’t feed him to the cat. Ah, dryer lint. They grow up so fast and before you know, they’re full-blown balls of debris ready to start fires of their own. This is one way to get your kids to take a hint and clean the lint filter. I’m feeling secondhand anxiety just looking at this photo. 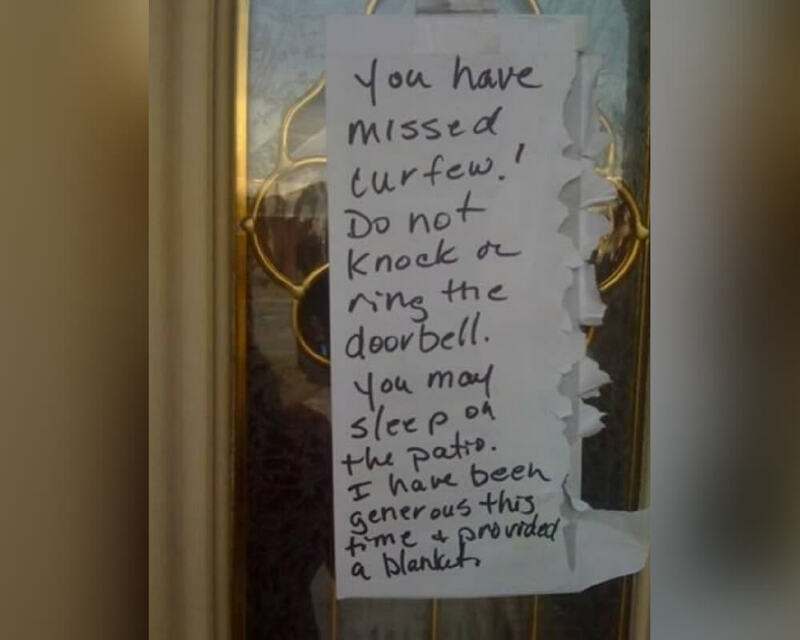 Judging by how this mom delivered her message, she is strategic and cold-hearted in how she hands down punishment. I see a bleak future for this kid. Up next: the dad who just wants his kid to eat their lunch. 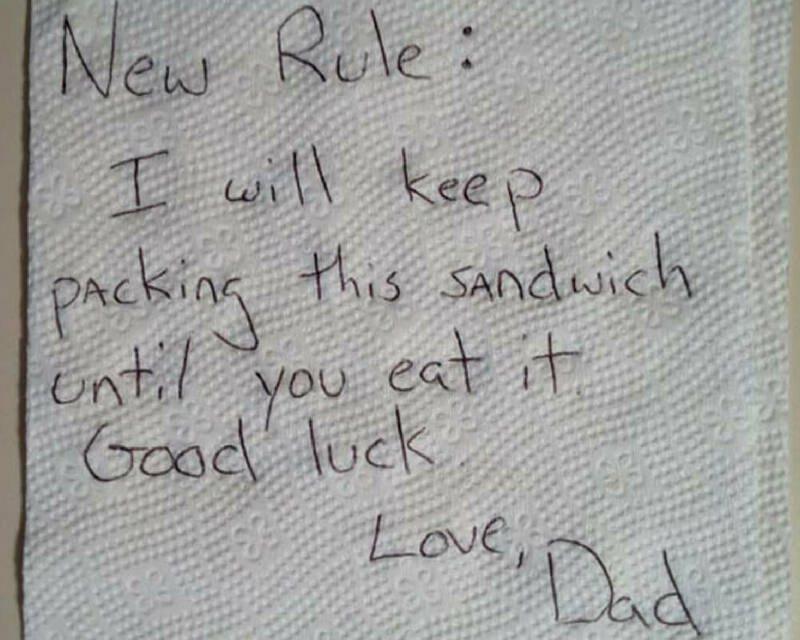 Remember the note from the dad that said he would keep sending the same sandwich until his kid ate it? Well, he strikes again. Judging by this note, it appears his son or daughter is still averse to his lunch packing choices. I wonder how many dad facts it will take until his kid actually eats their lunch. This is a truly cursed image for lots of reason. 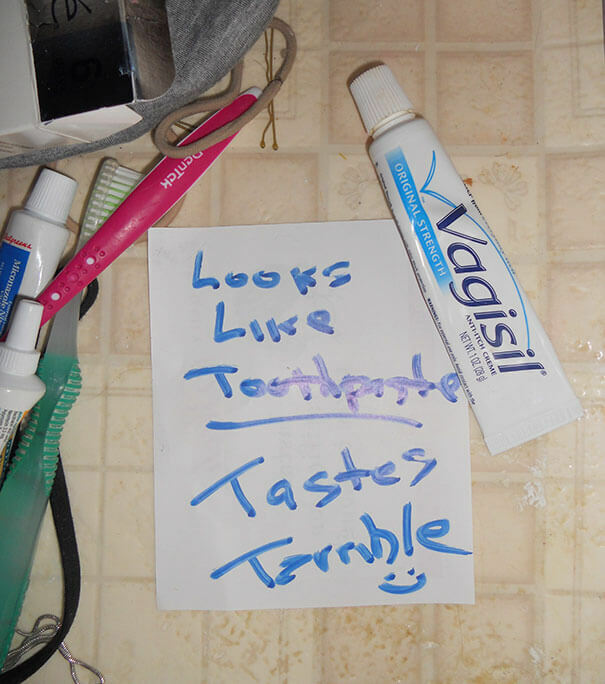 The thought of accidentally brushing your teeth with Vagisil is gross enough. 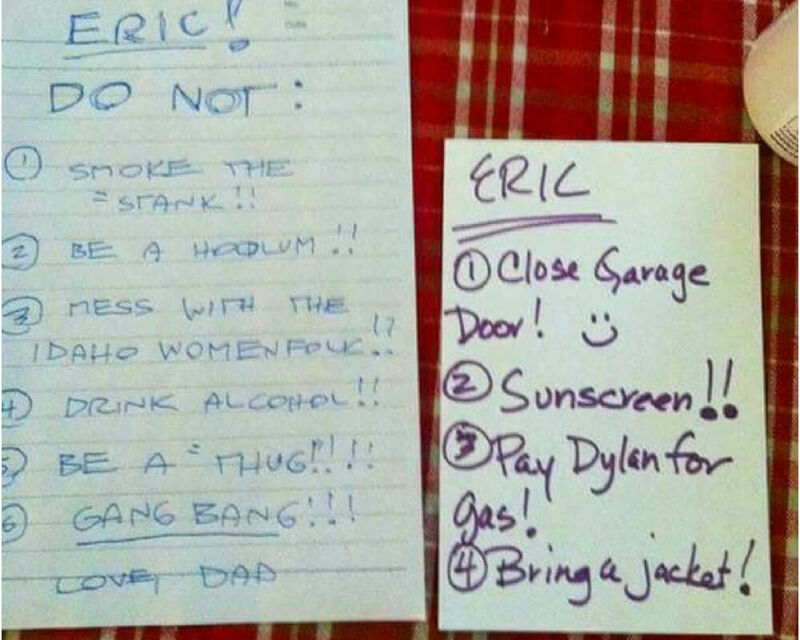 The fact that this note was left by a dad is even worse. Sometimes notes from mom and dad double as a user manual. In this case, mom and dad really want their kids to step up and start helping around the house, but don’t want them to destroy anyone’s clothes. 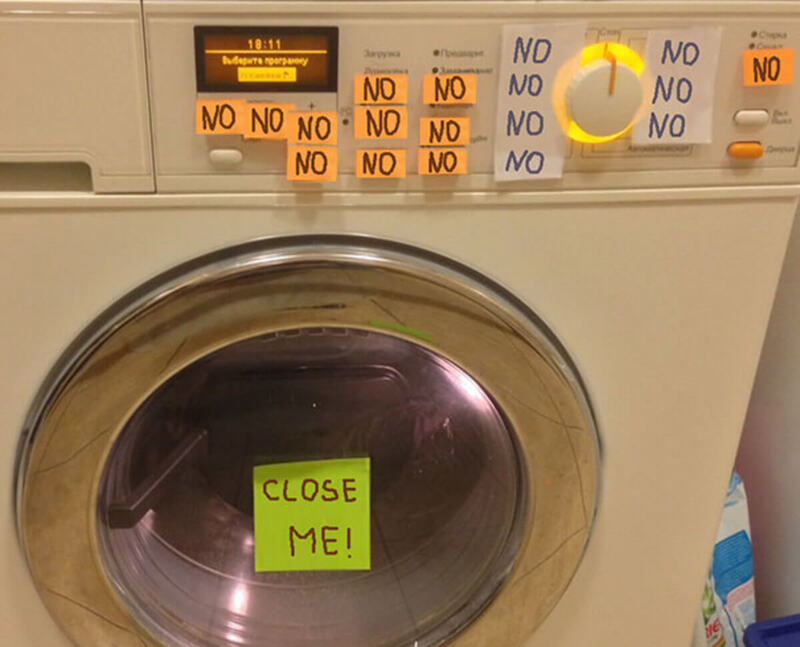 In these kid’s defense, doing your own laundry can be challenging. There are like 50 different settings that all seem to do the same thing. This mom is clearly trying to her hardest to get her kids to put their dirty clothes in the hamper. She even thinks adding a menacing face will help her cause. 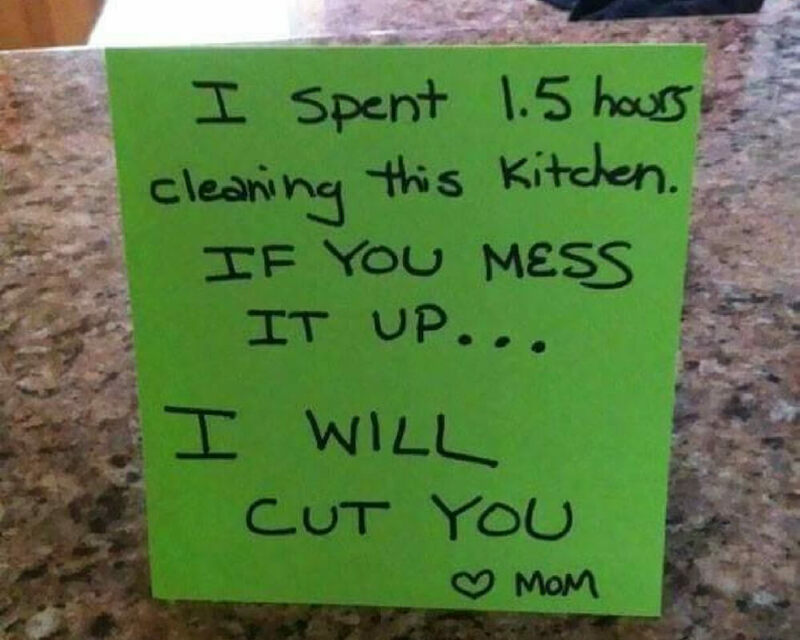 While she’s trying to make it sound like she means business, this mom is probably a softy at heart who had to try extra hard to keep herself from adding “I love you” to the bottom. This mom is smart. She knows you won’t forget your phone, but you will forget that cake she spent four hours making. This note is short and foolproof. At least, we hope. 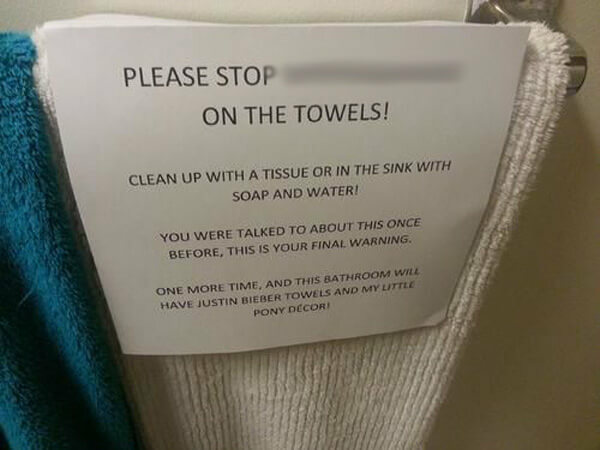 This mom knows exactly what her son has been up to in the bathroom. We may have bleeped out what it was, but you know it wasn’t showering that this guy was doing in there. Needless to say, this mom is tired of having crusty towels in her bathroom and is about to take some drastic measures to stop it. This is why you just don’t let your parents do your laundry. 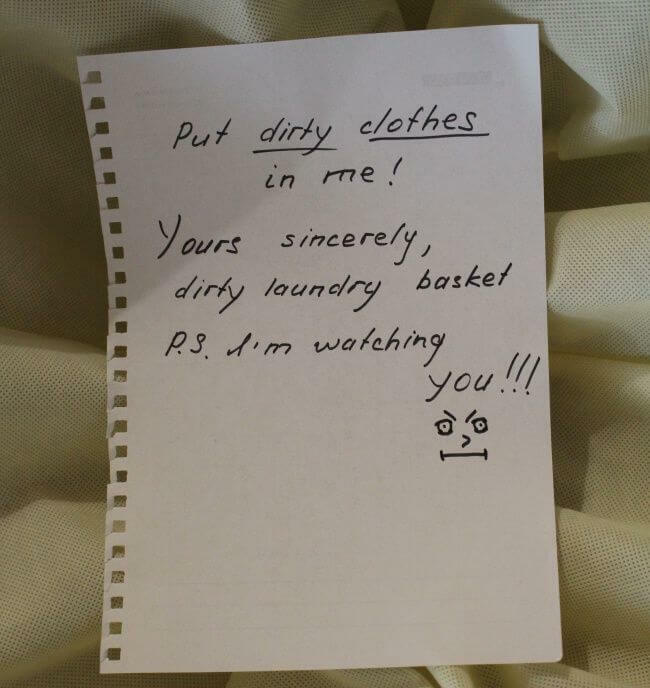 This person may have put the clothes in the wash themselves, but Mom took it upon herself to fold them. That’s when she found a certain surprise in the pocket. She handled it with perfect sarcasm and if anything, she’s more concerned about where you put her clear tape! Looks like Joshua is having a little too much fun after hours. If anything, he should perhaps lock his doors if he’s going to sneak around his parents. It’s surprising that he got away with sneaking more than one girl into his room in the first place, which is probably why his parents don’t seem that mad. They just want him to stay safe out there. This mom and dad cannot be bothered in the morning. They probably had this morning planned for weeks. Finally, they will have a morning where they can sleep in, which they probably haven’t done since their kids were born. If you have any questions, please refer to the note. 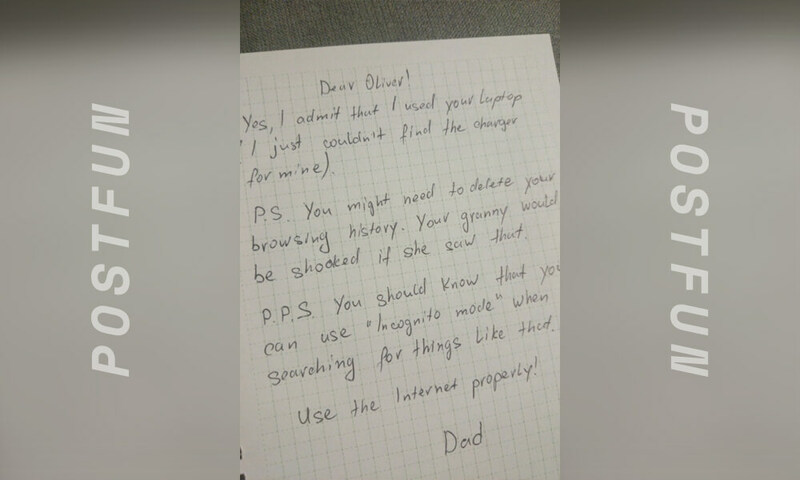 There are some spoiled kids about there who get upset when their parents use their things without asking and Oliver is probably one of those kids, which is why his dad left him this note. Apparently, Oliver’s dad is a true homie. He’s just looking out for his son, who might want to be careful about what he’s looking at online. 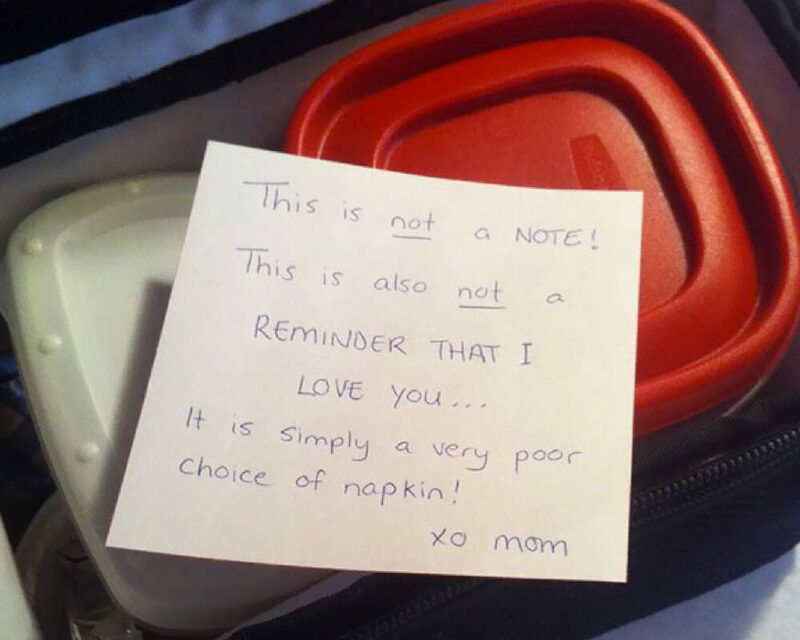 A lot of times we’re touched when our parents leave us kind notes with our lunches, but this mom wants to make it clear that she doesn’t care. She just wants to remind you to pick up some napkins on the way home. Have fun wiping up your banana mouth with this heartless piece of paper. 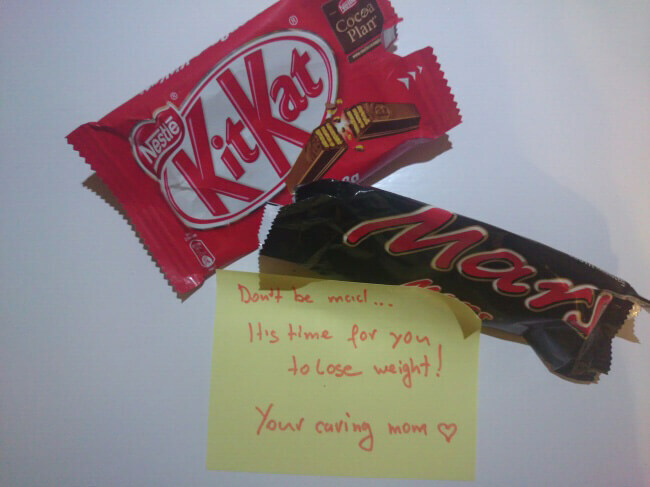 This mother knew that her child would be upset to find their secret chocolate stash eaten up. But she only did it because she care’s about her child’s health. At least she was being honest about what she thought. We can’t say that the conversation that happened after this was found was a good one. Imagine waking up home alone only to find a strange man with a machete roaming around the outside of your house. That’s exactly what Dave was about to wake up to. 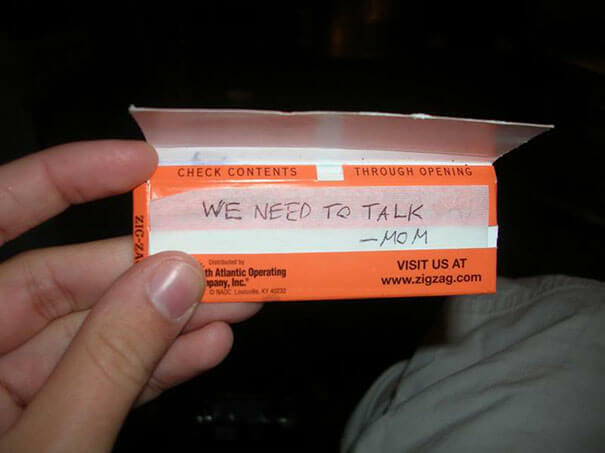 Luckily, his parents thought ahead and figured that Dave would be alarmed. But don’t worry, it’s just Steve. It can be pretty annoying for families that have someone who uses the cars without filling them up. Sure, they may get away with it at first but eventually, the rest of the family catches on. 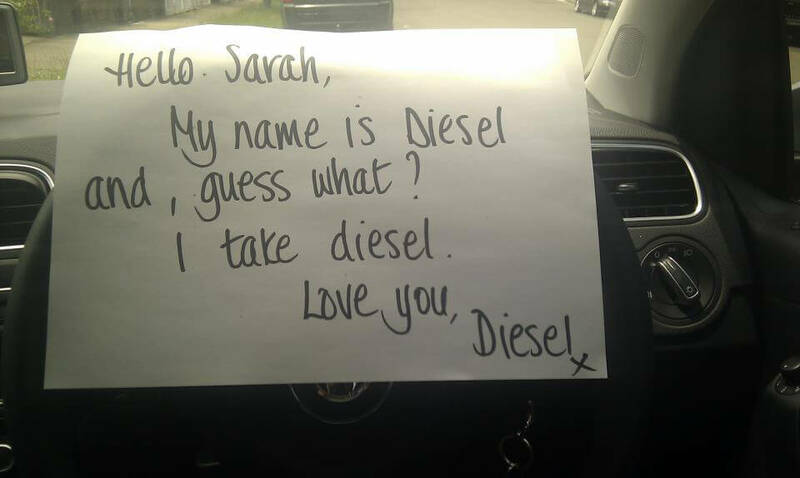 That’s why Sarah got this note from her mother about their car Diesel, which takes diesel fuel if you must know. 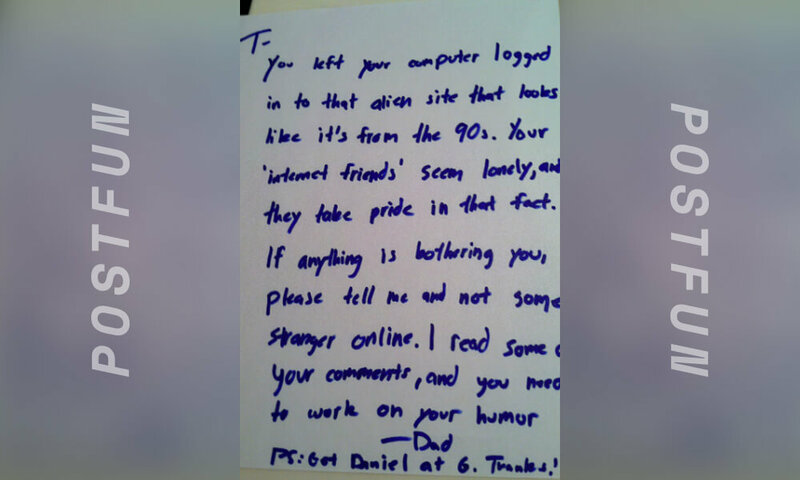 This person left Reddit open on their computer and their dad caught a glimpse of it. Dad was a little concerned about what he read on there and felt the need to reach out to his child about this. 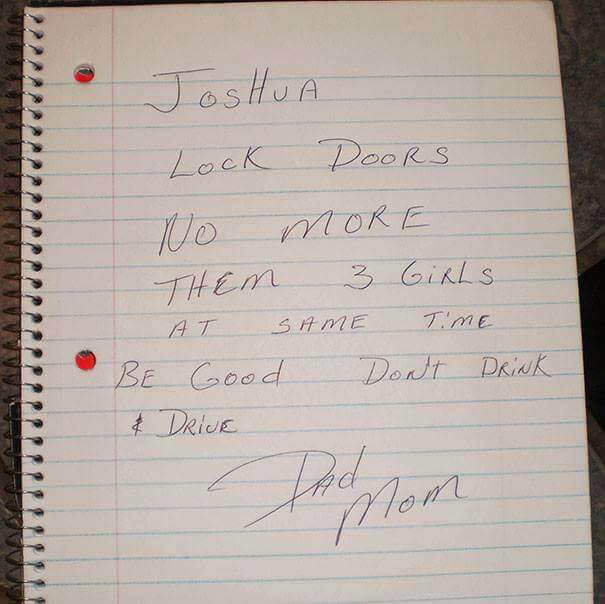 But at least this dad left a note instead of having this conversation in person. This person says they purchased a hatchet but didn’t put it away when they got home. 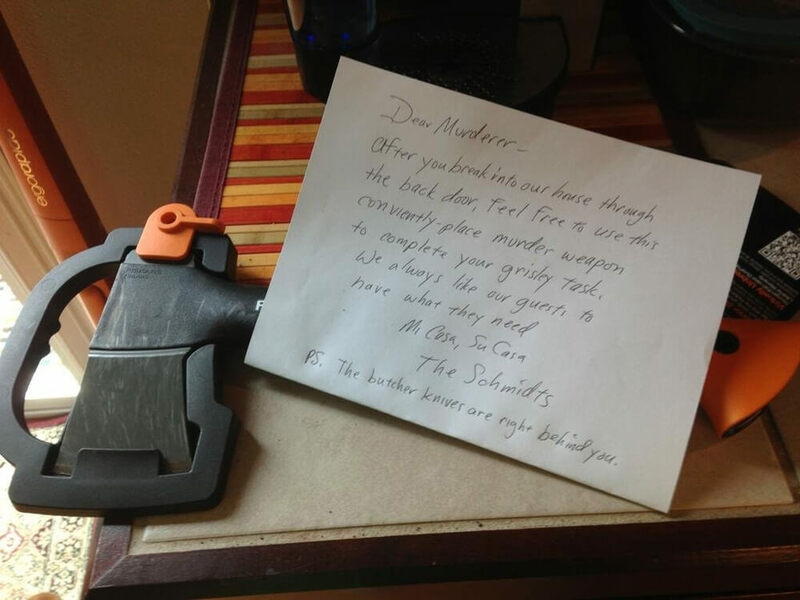 The next morning, they found their hatchet with this friendly note. This was definitely a convoluted way to let someone know not to leave their stuff lying around the house. But at least Mr. Schmidt knows a thing or two about hospitality. 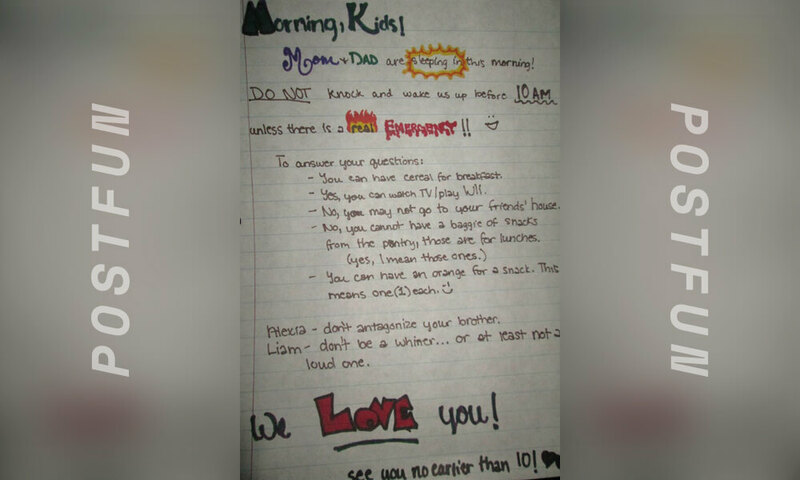 This person shared this note that their dad wrote to their brothers. 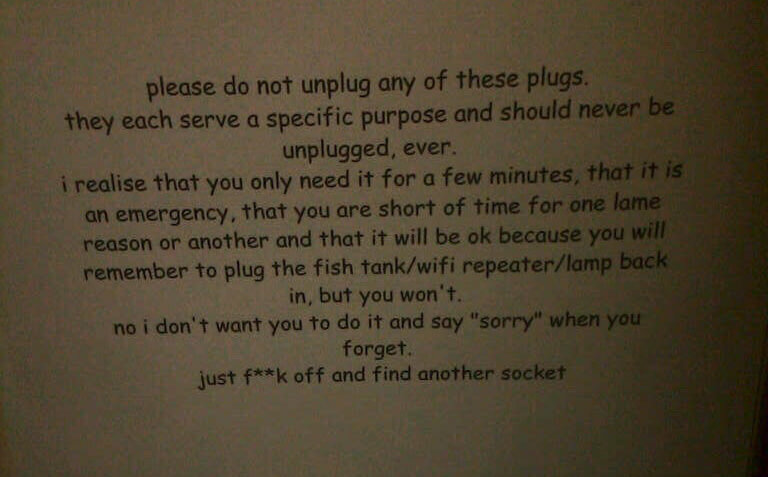 It seems that no matter how many times Dad tells them not to use a certain socket, they still do it. 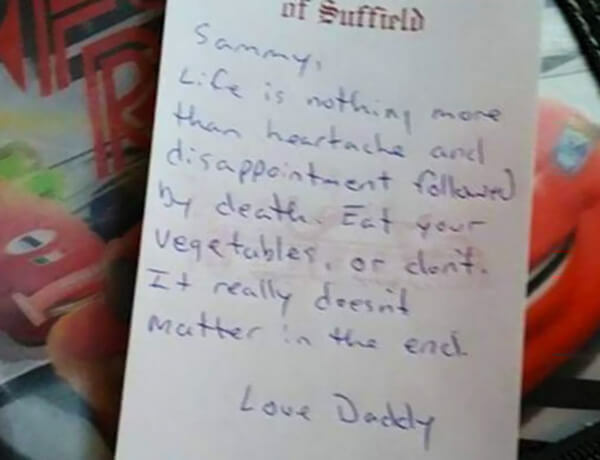 This dad left a kind note in his child’s lunch. We bet that when this kid opened his lunch he wasn’t expecting this existential lecture from his father. Maybe his father was feeling emotional that morning. Or perhaps he was just trying to be real with his kid before someone else was.